THE Inspired group were delighted to receive a visit from a special guest this afternoon and ended up getting an invitation to take a tour of Dáil Éireann. 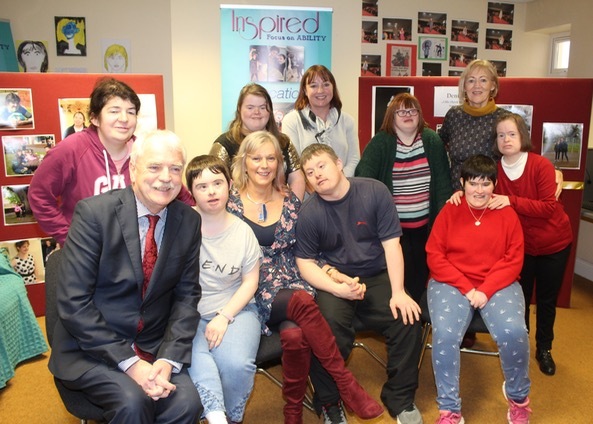 Minster for State for Disabilities Finian McGrath, went to the Inspired centre at Friary Lane and was hugely impressed with what the group is trying to do. Inspired is a community initiative based in Tralee where participants with an intellectual disability come from Tralee, Listowel and Killarney to attend. “I met him in the Dail about two weeks when I was at a meeting about a grant we are applying for,” said Maree O’Connor, a volunteer with the group. “I asked him would be visit us here and he got back to us within a week to say he was coming. I wanted him to come to hear what the participants in Inspired had to say and what they want from their lives. They want to help their community and to find purposeful work and to continue their education. And that’s what happened today,” said Maree. “He spoke to them too and told them to find what they are good at and go for it. That in effect is what we are supporting them to do. We’re not minding them, we’re not serving them. We’re letting them be what they want to be and giving them the support in that process. He got the message and agreed with what we’re trying to do,” said Maree. The Minister invited the participants of the group to come to the Dail in the new year where he will show them around the building and his office. The Minister then left the centre to head for the IT Tralee where he spoke to social care students on disability policy and strategy. He also visited the CARA centre for adapted physical activity and met with the UNESCO Project at the college. IT Tralee has the UNESCO Chair for inclusive physical education.